Floral patterns are everywhere this season. From fashion to home decor, you can't escape these beautiful and vintage-inspired prints. The bridal world is taking notice and incorporating this popular trend with a variety of gorgeous floral-patterned bridesmaid dresses. Allowing your bridesmaids to choose a dress in their favourite cut with an elegant floral pattern is a great way to incorporate even more romance to your wedding day. 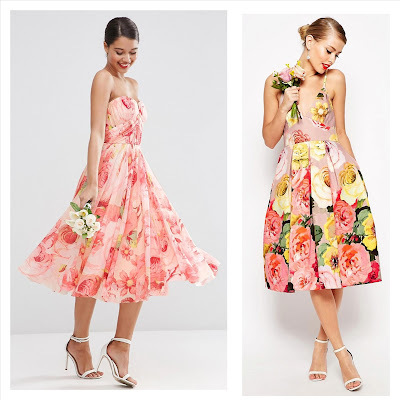 Here are six of my favourite floral-patterned bridesmaid dresses to help inspire you and your bridesmaids for your special day. 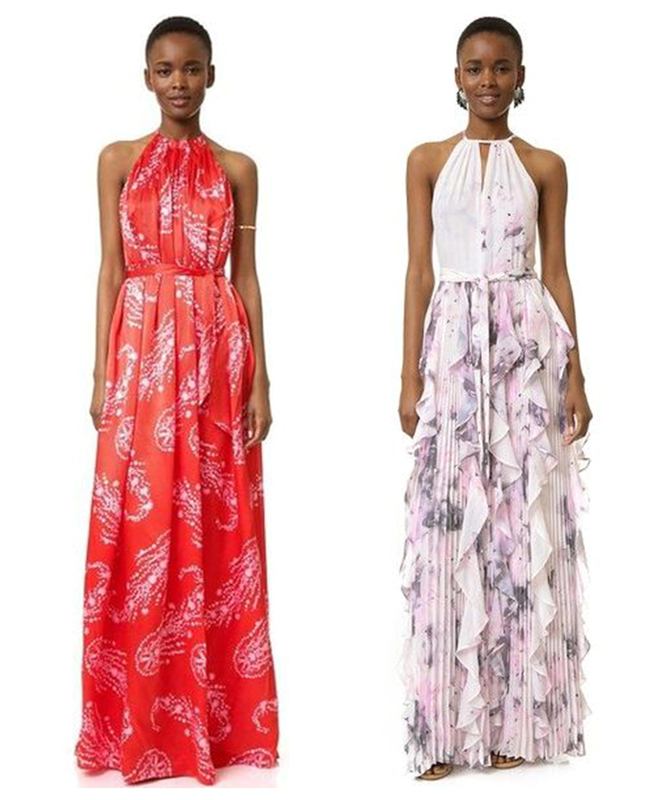 A maxi dress can be incredibly flattering on many different body types, and I love the halter style necklines on these gorgeous bridesmaid gowns from shopbop.com. The bold red colour and large floral paisley print of this Cynthia Rowley dress are unforgettable, while the combo of pleats, ruffles and a soft watercolour floral print are absolutely divine on this bridesmaid gown by PARKER. A touch of modern and boho blend perfectly in these two floral bridesmaid gowns. Are you planning an outdoor garden-style wedding? 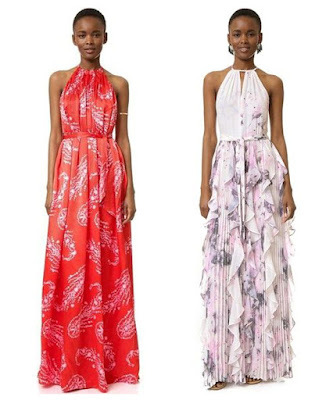 I highly recommend a tea-length floral print gown like these two from ASOS. The strapless sweetheart neckline and flowy fabric of this pink floral print dress will look amazing on your bridesmaids. Want something a little different and ultra chic? Choose a structured, pleated tea-length dress like this bold beauty from ASOS. A bonus of tea-length gowns? Your favourite ladies will keep cool on a hot summer day in this classically cut style. 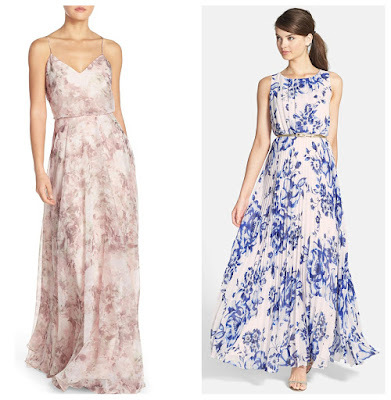 These long, sophisticated floral gowns from Nordstrom are both timeless and classic in style. Choose this soft v-neck dress by Jenny Yoo and watch your bridesmaids wear it again and again! I am in love with the high neckline and elegant print of this Eliza J gown. It is Grecian-inspired and also reminds me of a vintage fine China print with the beautiful blue and white colour combo. Every one of these dresses could easily be worn over and over by your bridesmaids after your wedding day. Dress them up or down with a variety of accessories, jackets, cardigans and footwear. The possibilities are endless! Are you looking for more bridal inspiration? Follow us on Pinterest and get daily bridal inspo and more!